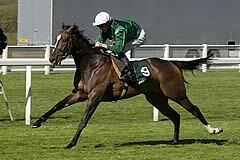 Henry Candy’s Limato won twice at Group One level in 2016, landing the July Cup and the Prix de la Foret, but his only victory of last season came in this seven-furlong Group Two. The six-year-old was disappointing in the first half of the current campaign, including over a mile in the Lockinge at Newbury and the Queen Anne at Royal Ascot and again failing to fire when bidding for a second July Cup. However, confidence-boosting Listed-race wins at Newmarket and York got his career back on track and he completed his hat-trick in some style in the hands of Harry Bentley. The 7-4 favourite was always travelling within his comfort zone and never looked in danger of being caught after striking the front, scoring by a length and a quarter from Zonderland. The Challenge Stakes was established in 1878, and the inaugural edition was titled the First Great Challenge Stakes. It was originally contested over 6 furlongs and open to horses aged two or older. The present system of race grading was introduced in 1971, and for a period the Challenge Stakes held Group 3 status. It was extended to 7 furlongs in 1977, and closed to two-year-olds in 1985. It was promoted to Group 2 level in 1987. The race was formerly staged during Newmarket's Champions' Day meeting in mid-October. It became part of Future Champions Day in 2011.